I hate to leave my child with special needs out of all the holiday festivities. What can I do to make the holidays enjoyable for everyone? Crowds, lights, noise, strangers, hugging, and a change in routine can be a recipe for stress and sensory overload for special needs children during the holiday season. Parents and caregivers need to be flexible during this time of year. 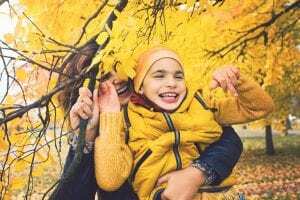 You may need to alter traditions and create new traditions that include your special needs child. No matter which holidays your family celebrates, being organized and following a few tips can help make it a fun time for the entire family. Designate a space where your child can go when overwhelmed. Ensure everyone knows that this space is off limits to other family and guests. Set limits to exposure so your child does not become overstressed or overexposed to excessive sensory stimulation. Discuss with your child the schedule of events for special activities. Your child will be more relaxed and calm knowing what is coming up. Let them know what to expect during each event or activity. Let your family know what to expect as well. If your child does not like kisses on the face, explain that to friends and relatives. Stories, books, and movies that are related to the holidays can be a big help in preparing your child for what to expect during the holidays. If you’re planning to be at a party, gathering, shopping center, or restaurant, set a reasonable time limit and stick to it. Rushing and relaxing don’t go together. Make sure you leave enough time to enjoy whatever activity your family is engaging in. Avoid taking your children shopping on the busiest shopping days of the year. The chaos, noise of large crowds, and long lines will definitely add stress to your life. Know and be aware of what triggers your child to have a meltdown. Avoid these if possible. Know how you will react and have a plan if your child does have a meltdown. Relax your expectations and definitions of what the holidays should be like. Just have fun. If you don’t accomplish everything you expected, it’s okay. Just being together creates memories. The holiday season doesn’t have to be a stressful time of year for your special needs child! Taking these few small steps can ensure your holiday season is a stress-free one.